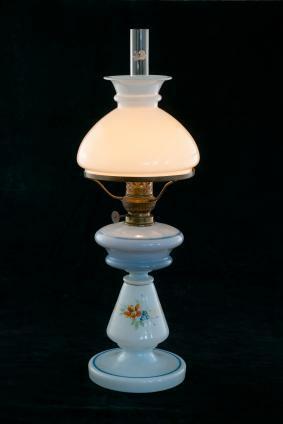 Antique kerosene banquet lamps are a must in any authentic Victorian parlor. Large and ornate, these lamps create an authentic look and are much sought after by antiques enthusiasts. While there are other types of antique lamps that may have some of these details, all of the characteristics must be present to be a true banquet lamp. The banquet lamp is often called the Gone with the Wind lamp because there were several used as props in the movie. Actually the banquet lamp was not in use until about 1880, twenty years after the setting in the movie. The lamps were a sign of affluence and good taste amongst Victorian society and could be found in parlors, libraries, and reception halls. They were sold until about the 1920s when electricity became more common in most homes. Even so, many homeowners converted these beautiful lamps to electricity and kept right on using them. Since antique banquet lamps were so ornate and unique they can command extremely high prices among collectors. The more intricate the design the higher the price can be. It would be unusual to find an antique banquet lamp in good condition for under $250 in most areas of the country and you could pay more than $900 for an elaborate lamp in excellent condition. Condition - Are there cracks, chips, or scratches? Is the pattern bright and intact? Does the lamp have all its parts and are they in working condition? Has it been electrified? Desirability - While all banquet lamps are desirable, some are more so than others. A unique, hand painted design or especially elaborate fount or base will add value. Provenance - Who owned it? If it was used in the White House, on the set of a movie, or has some interesting story about its past it may well bring more than another, less interesting lamp. Rarity - As always, the rarer an item is the more people will pay to own it. Location - Antiques vary in price all over the country. Some areas seem to value a particular type of antique over another. In addition, a banquet lamp will likely be more expensive at an auction of antique lighting or Victorian objects than it would at an auction where a variety of antiques were being sold. When you buy on the Internet always check the seller's rating and his return policies. Get your package insured so that if anything happens you won't have lost your money. Finding the perfect antique lamp to complement your home may take time but you will be rewarded with a beautiful piece of history. Once you have it you may wonder whether or not you should convert it to electricity.Each collector has to answer that for himself. The conversion process permanently changes the lamp and it will never be exactly as it is now. On the other hand converting the lamp will give you a light that you can use in your home. If you are buying it for investment purposes you should not convert it; but, if you are decorating with it and you really want it electrified, have it done professionally.